Last night's amazing trailer for Doctor Who's upcoming Birthday bash was packed to the rafters with kisses to the past. Some were obvious, like the oodles of past Doctors, companions and monsters - but some were a little more secretive, hidden in plain sight. Here's 24 you might have missed! The Eleventh Doctor's headgear du jour, which first made an appearance in 2011's The Big Bang, flies past as the trailer blazes into colour. Hanging on the top shelf of the rack to the First Doctor's left is a darkened version of Hieronymus' creepy golden mask from The Masque of Mandragora (1976). Two shelves below that, we see the head of a Roboform - a.k.a the Pilot Fish née Robot Santa - from The Runaway Bride (2006). A Gallifreyan Fob Watch from the Chameleon Arch, from Human Nature (2007), floats just by Hieronymus' mask. The ceramic guise of one of the SS Madame du Pompadour's Clockwork Androids from 2006's The Girl in the Fireplace is shown falling from the shelf. Now this one's a timely reference! A tiny Yeti sculpture sits on the middle shelf - the tiny sculptures were used as tracers to summon their larger, hairier Yeti brothers in the recently recovered The Web of Fear (1968). The poor exterminated soldier the First Doctor is watching flies over this sign for the local Pub in Devil's End, the village setting of 1971's The Dæmons. The Tracer device, often seen being waved around by Mary Tamm's Romana I during Season 16's hunt for pieces of the Key to Time, is floating by the Polyphase Avatron. The shadowed Second Doctor is framed by the Himalayas - home of the Dat-Sen Monastery and where we first encounter The Great Intelligence and the Yeti in 1967's The Abominable Snowmen. Sarah Jane Smith stands in a ruined London, where a Dalek Saucer (in the style of the ships first seen in 2005's Bad Wolf and The Parting of the Ways) hovers over Big Ben. As we transition to Clara looking into Sarah's crystal ball - which still has Sarah Jane's reflection in it - the Leaf that she kept in her 101 Places to See book floats by. It's technically the leaf from this year's The Bells of Saint John rather than the leaf used at in the finalé of The Rings of Akhaten: the production team used a different shaped leaf in error during filming. Brainy specs! The half-moon spectacles worn by the Fifth Doctor in several of his stories - and referenced by the Tenth Doctor in 2007's Children in Need short Time Crash - fly past the cricket ball he's bowling. Also flying past the Fifth Doctor's cricket ball is the spade-shaped TARDIS Key, designed by Jon Pertwee (!) and first seen in 1974's Season 11. As we blaze through the Doctors of old battling monsters and aliens, a Judoon's scanning/translation device from Smith and Jones (2007) goes hurtling by an Ood. Sarah Parish's giant arachnid empress from The Runaway Bride (2006) is seen scuttling over the rocks behind the Eighth Doctor. This series of numbers briefly seen at the feet of the Ninth Doctor actually breaks down to 17:16 23/11 - 5.16pm on November 23rd, the exact time An Unearthly Child began in 1963. The Third Doctor's favourite yellow roadster, first seen in Doctor Who and The Silurians (1970), is seen driving past in the background on the the Tenth Doctor's right. San Francisco's iconic bridge is seen in the far background beyond the Eleventh Doctor's rock platform - it made an appearance in 1996's TV Movie, which was set in the city. And on the other side lies The Shard, an 87-storey London Skyscraper first opened last February, which played a significant role in Series 7B's opening episode, The Bells of Saint John (2013). The rocky outcrop the Eleventh Doctor is standing on has the circular language of the Time Lords etched into its side. Whatever does it say? 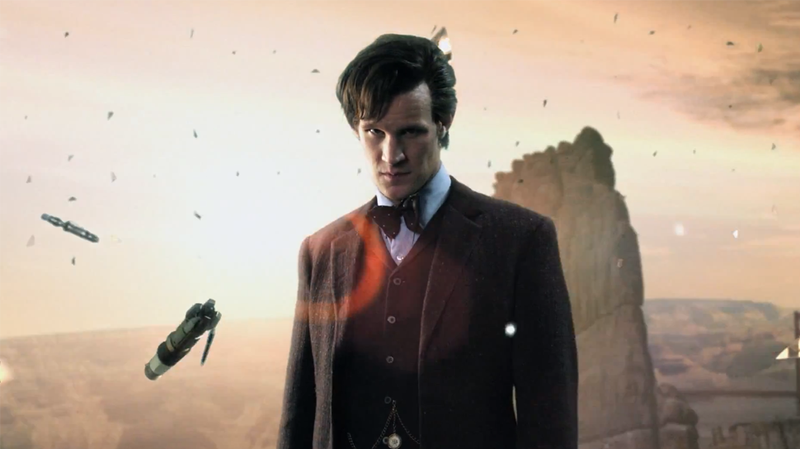 Fragments of the Key to Time from 1978's Season 16 are seen floating around The Eleventh Doctor at the end of the trailer. As the Eleventh Doctor reaches out for his own Sonic Screwdriver, we can see the Master's screwdriver of choice float by, first seen during the climax of The Sound of Drums (2007). Laser beats Sonic! Finally, floating just by the Laser Screwdriver is Matron Cofelia's Sonic Pen, her stylish accessory seen in 2008's Partners in Crime.